To the Bat-TV, Robin! 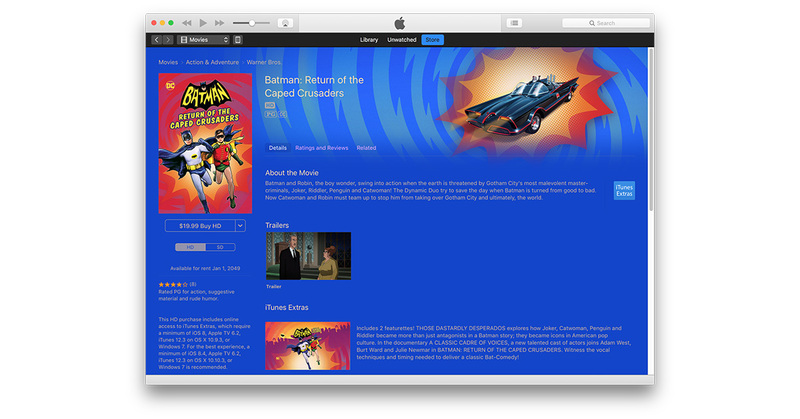 Batman: Return of the Caped Crusaders hit the iTunes Store on Tuesday. The 90 minute animated movie brings back the awesomeness of the 1966 television series, complete with Adam West and Burt Ward reprising their iconic roles as Batman and Robin, and Julie Newmar joins in as Catwoman, too. There are Bat-labels galore, plenty of campy jokes, and loads of fun. You can download Batman: Return of the Caped Crusaders for US$19.99 so you can watch any Bat-time on your Bat-iPhone, Bat-iPad, and Bat-Apple TV.